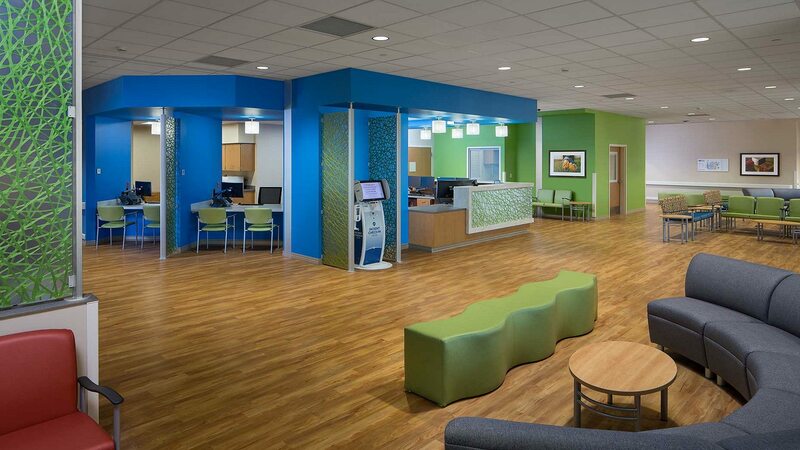 TMPartners designed the new Emergency Department to efficiently adapt to fluctuating patient volumes and levels of care, including a separate Pediatric Emergency Department to meet the needs of the smallest patients and their families. While still capitalizing on staff efficiencies, the Pediatric ED offers a welcoming and comfortable environment for patients and visitors with dedicated entrance canopy, lobby, triage, support and 16 exam rooms. 16 dedicated pediatric exam rooms. New Helipad located above Ambulance Canopy. New Walk-in/Waiting entrances for Main ED and Pediatric ED. Relocation of Cardiac Rehab, Physical Therapy office, Bed Control, and Pre-admission Unit.